The Congress has alleged that the government was procuring each aircraft at a cost of over Rs 1,670 crore as against Rs 526 crore finalised by the UPA government. "Rahul Gandhi should reveal his source of information," she added. 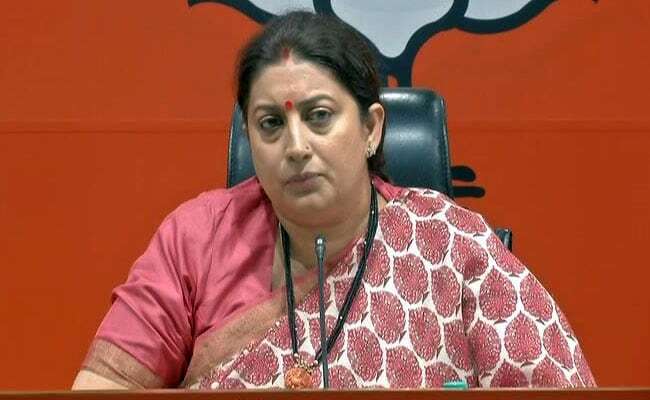 Union minister Smriti Irani on Monday accused the opposition Congress of trying to malign the country's defence establishment and said "lies" of the party's chief Rahul Gandhi on Rafale deal have been exposed. The Congress is trying to play with the national security and is spreading lies to mislead the people, Ms Irani said. "The Congress has not only spread lies but has also tried to malign the Indian Air Force and the defence establishment. The Congress has tried to stand in the way of strengthening our forces," she said. "The lies of Congress and its party president Rahul Gandhi have been exposed. Rahul Gandhi should reveal his source of information," she added. The Supreme Court on Friday dismissed the pleas challenging the deal between India and France for procurement of 36 Rafale jets saying there was no occasion to "really doubt the decision making process" warranting setting aside of the contract.